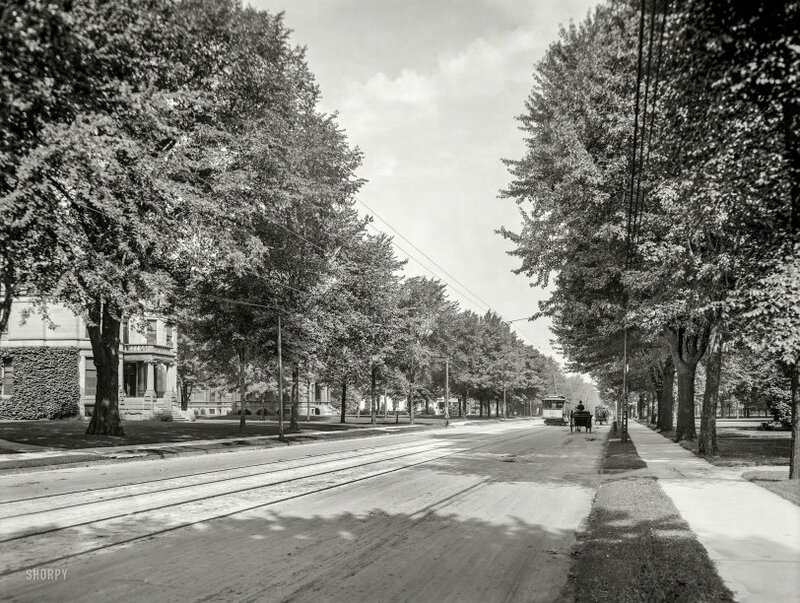 Detroit circa 1905. "North Woodward Avenue." 8x10 inch dry plate glass negative, Detroit Publishing Company. View full size. Submitted by signalman on Tue, 04/24/2018 - 5:27pm. The power wires GCR points out are for the trolley car power system. It was, indeed, a Direct Current (DC) power system. Most streetcars used 600 volt DC power; the heavy wires on the poles are additional feeders for the trolley feeder system; the trolley wires alone would not be able to carry the current for the entire length between substations. Submitted by LarryDoyle on Tue, 04/24/2018 - 2:07pm. Most Likely feeders for the DC streetcar line. Submitted by GCR on Tue, 04/24/2018 - 11:06am. Are those power lines with the metal poles and heavy gauge wire part of a DC distribution system ? They sure don't look like any AC system I have seen . Submitted by Born40YearsTooLate on Tue, 04/24/2018 - 10:07am. Looking at the picture, I see only one thing that looks like a hitching post, on the right side. I would expect to see more hitching posts, and mounting blocks, too. Were they already taken up by 1905, or are they not present because it's a major thoroughfare? Submitted by Dbell on Tue, 04/24/2018 - 10:51am. Submitted by bethjody on Mon, 04/23/2018 - 4:54pm. ...this is what I picture. Quiet, lovely street with grand houses. Submitted by rhhardin on Mon, 04/23/2018 - 1:07pm. What's with the guy on his cell phone.